Various Artists – Flakes | Esc.rec. Many thanks to all artists involved! 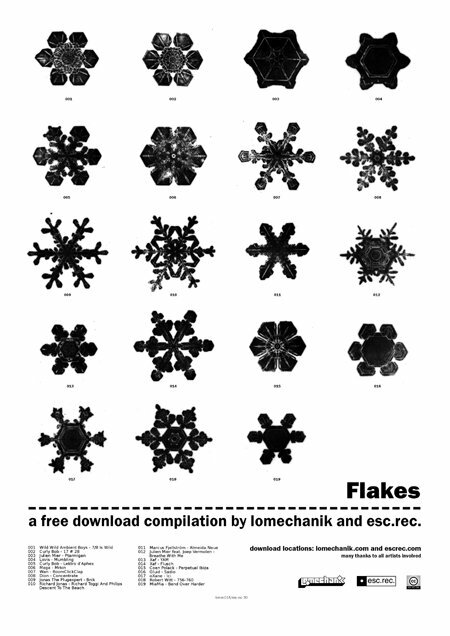 Flakes is a joint release by esc.rec. and Lomechanik. In this cold December month two small independent labels from the East of The Netherlands flirt with eachother. The result is a free download compilation entitled Flakes, officially released on December 18, 2010. Please download from www.escrec.com and/or www.lomechanik.com. Esc.rec. and Lomechanik have a considerable overlap in their musical preference and besides a couple of artists in their catalogue they also share a mutual interest and vision on current music industry. Their main concern is bringing adventurous music the attention it deserves. If anything, Flakes proves these labels to be open minded music connoisseurs with a joint interest in narrative music. With many thanks to the artists who contributed to this release, Lomechanik and esc.rec. proudly present this Christmas present to everyone who wants to listen. Enjoy!